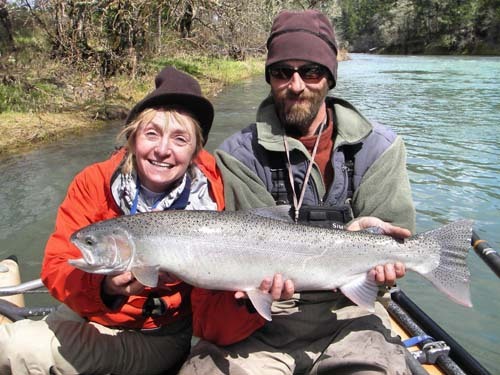 Rebecca Blair (fellow member in three other clubs with me) and I went on the South Umpqua with guide Dave Teitzel in March. Dave is 6'7" and his nickname -- to differentiate him from all of the generic Daves - is ‘Tall Dave'. This will have more meaning in a minute. 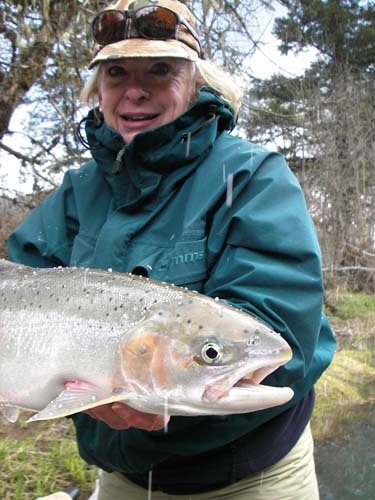 Dave doesn't normally guide on the South Umpqua as it has far fewer steelhead. But the fish that come back can be larger. Last year, I landed a 37" steelhead and put our (the fish, Dave and me) picture on my Cabela's credit card. Dave also loves this river and doesn't want to spoil it with people who whine that they aren't catching fish. Rebecca and I agreed not to whine and he likes us so he agreed to guide us for two days. I had told Rebecca that I was tired of dragging extra clothes back and forth and not wearing them. This time, I was taking one set of warm layers and wearing them both days -- also known as ‘fishing dirty'. I would wear my fishing jacket to dinner. Rebecca agreed and we packed light. Coincidently, Dave had emptied his dry bag to clean all of the extra clothes he normally carries as they get pretty smelly over a season. He hadn't had time to re-pack the bag but wasn't worried as he has fished with Rebecca and me many times and knew that we weren't beginners. On Saturday, it was 25F at the boat launch. It was mostly sunny and we were bundled up. This is foreshadowing for events to follow. You can start humming the theme music from "The Titanic" now. I had done a somersault going in and had twisted around so I was underwater looking up at the pontoon. Dave said I was in about 8 -- 10 feet of water. And I was lucky as there weren't any rocks to hit my head on when I went in. The heavy current was sucking me under the pontoon towards the center of the river and my kicking wasn't doing any good. No, I was not wearing a floatation device and I don't wear a wading belt. My waders just sucked up against me but all my layers of fleece wicked water all the way down to my socks -- my waders did not fill up with water. The good news was that the air temperature was so cold (25F) that the water temp (41F) made it seem as if I was going into warm water. I didn't have that sudden cold shock that makes you want to levitate out of the water. Dave said that when he realized I was out of the boat and under water that his one thought was, "I have only one chance to grab her". He leaned way over and plunged his arm up to his neck into the water to make his grab. He has very long arms. I saw his hand coming down towards me and, as I reached up for his hand, he was able to pull me up out of the water and against the pontoon. Because the pontoon was so high and the current was still sucking me under, I couldn't get up into the boat. Dave asked if I could hold onto the pontoon and I couldn't. Then we tried the frame and I couldn't get a good enough grip to hold against the current. Next we tried the anchor rope that ran along the inside of the boat and that worked. Again, thinking becomes very linear. Does this work, no, then try the next thing. I knew that if he needed to release the anchor, I was going to have to do something else, but in the meantime, it worked. My arms were stretched up and over the side of the pontoon and the current was pulling my legs and body under the boat. I was now in Dave's rowing path for his right oar. He couldn't use his right oar without risking knocking me off. I had been able to glimpse back and see a beachy area but Dave was rowing with just the left oar towards the center of the river and the heavy current. I said "Wait" and he said "No, you have to hang on". At this point Rebecca turned around and realized that I was in the water. She hadn't realized anything had happened as she was facing forward. She said that she heard us talking but no one screamed or yelled until she did when she stood up and lunged for me. This was automatic on her part and Dave ordered her to sit down again. This whole experience was probably the worst for Rebecca as she had to just sit and watch. Dave told me again to "Hang on tight and don't let go". I looked ahead and saw a bunch of rocks coming up. Dave had rowed into deeper water to give me as much water cushion over the rocks as possible as he rowed with one oar. He said this was the scariest part for him because if I got a foot caught in between rocks or took a hit and got knocked loose, he wasn't going to be able to grab me. My rod was caught between my body and the side of the pontoon but the rocks in the shallower water were now bumping the rod loose. I knew I couldn't let go of the rope so I grabbed the rod in my mouth and held onto it with my teeth. We went through a few more runs until we got to a spot that had a beach and where Dave would have enough time to get us over with one oar. As we beached, Rebecca jumped out and helped me up. I don't remember this part but she said my first words were "Rebecca, I'm so sorry" because we were going to loose fishing time. As I stripped down to my liners, Dave got out his little propane heater. I can't say that it did much good with the air temp that cold. None of us had any extra clothes but Dave was wearing two fleeces and gave me one to wear and we bundled up all of my wet clothes and talked about what had happened. Dave said that he couldn't have reached the first beach with one oar and if he didn't make it, I would have been slammed up against the rocks. I told him that if I had come loose I would have pointed my feet downstream and waited for a gravel bar. He said that the South Umpqua is a "young" river and I would have gone through another mile or two and several rapids before coming to a place to land. I was really cold the rest of the morning but at lunch we anchored in a sunny spot and I was able to warm up enough so I was pretty comfortable the rest of the day. Dave felt we were cheated as Rebecca and I both got skunked that day. That night we went back to the motel, threw all of my wet clothes into the dryer, and had margaritas for dinner. Sunday, we went out to colder weather with some sleet and hail. I had been urging Rebecca to try my 10' rod as it makes a big difference casting. Dave anchored us by a rock platform that hung out into the river. Rebecca was peeling line off of my reel getting ready to cast and I was telling her how much she was going to like the rod. Dave cautioned her not to stand so close to the edge as the fish could be under the overhang. As we're talking, the fly is whirling around in the current and she hadn't cast yet when a 28" steelhead came out from under and took off with the fly like a freight train down river. Dave was yelling that we were going to loose the fish but Rebecca played him well and she got her pictures. Shortly after, I landed another 28" fish that still had some sea lice on him but the little white spots in the picture are hail. In the afternoon, Rebecca landed and kissed good-bye a really nice 32" fish and I caught a 30" right after her big fish. Did the Fish Feel Cold?